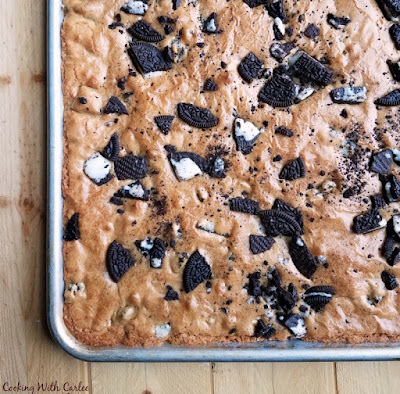 A nice big batch of brown sugary cookies and cream blondies is the perfect way to feed a crowd. Bring them to your next potluck, BBQ or party and watch them disappear. I was in a baking mood recently and hadn't brought treats to work in a while. So I figured I could scratch my baking itch and fill up the coworkers making everyone a winner! Of course something easy to grab and eat without utensils is ideal for the work goodie table. A bigger batch is in order too. 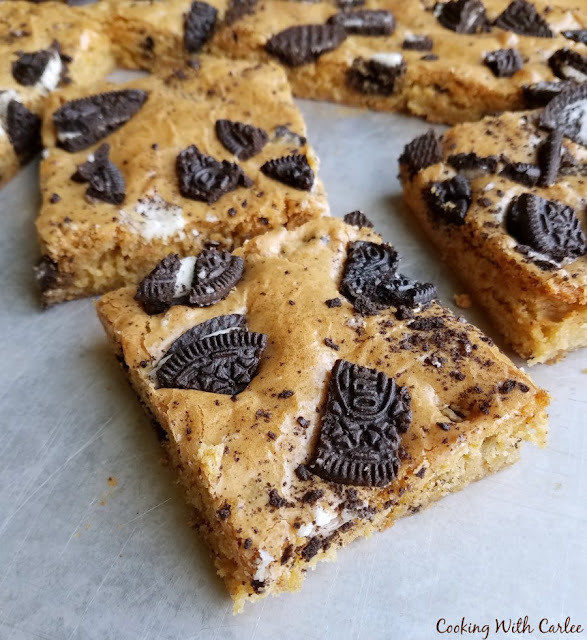 I had actually had the idea for these fun cookies and cream blondies for a while now and it seemed like a perfect time to make them a reality. I love making blondies like this because they take so very little effort to put together and the number of possible variations is almost endless. Our obsession with blondies started with the candy bar blondies a couple of years ago. Then last year we made fun Easter egg blondies. Both were so well received, so I cannot wait to make a bunch more different flavors. But this time I decided to go with cookies and cream. What is it about cookies and cream that makes it so popular? I suppose there's that thing that they taste so darn good! I mean, I guess that's reason enough right? My coworkers are fans as well, so I knew I had a winner on my hands before they even hit the oven. 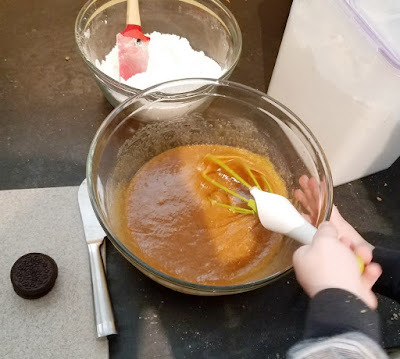 Of course Little Dude got in on the act and put together the batter. I chopped up the chocolate sandwich cookies while he put together the rest of it. He just loves to measure, mix and help. Luckily these don't take a mixer or anything fancy, which makes it even easier for him to help. I left a couple of pieces at home for us and took the rest in to the office. The plate quickly disappeared despite the fact that a lot of people are "watching what they eat." I suppose they were watching it go into their mouths if nothing else. That's the way I usually watch what I eat too! 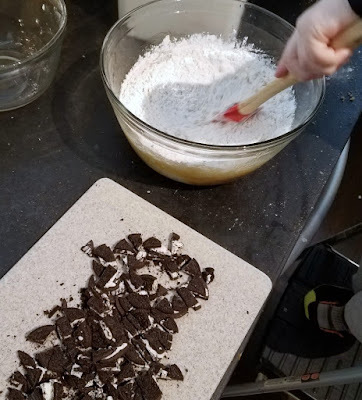 If you love cookies and cream deserts and want some more ideas, we loved the cookies and cream cake I made for my sister's baby shower. But one of our absolute favorites is the cookies and cream cheese ball. Every time that one gets made, it gets gobbled up in no time flat! 1. Preheat the oven to 350 F and spray your 13x18x1 pan (half sheet jelly roll pan) with non-stick spray.2. In a medium bowl, whisk together dry ingredients and set aside.3. In a large bowl, stir together brown sugar and oil. Beat in the eggs and the vanilla.4. Stir in the dry ingredients until well mixed.5. Roughly chop the sandwich cookies and fold half of them into the batter.6. Spread in prepared pan and sprinkle the remaining cookies pieces over top of the batter. 7. Bake for 30-35 minutes. The edges should be golden and the middle should test clean with a toothpick is inserted.8. Cool completely and then cut into squares. Store in an airtight container. A perfect blend of some of my favorite flavors!! Your cheese ball is one of my favorites so I can only imagine how wonderful these are!! Happy Monday pretty lady! Hi Carlee, I love chocolate brownies, but never have ventured down the path of trying blondies. I really should. I do love the way you make sugar sound so good, I don't really drink and I don't smoke, but I do like sugar and some people are really shocked by that addmission. It's been far too long since I've had a good blondie. This recipe looks scrumptious! You should remedy that ASAP! I'm sure your co-workers probably devoured these. Cookies & Cream are just such an awesome combo! One of my favorite combos for sure and they flew right off the plate! What a fun dessert! We'd love these around here! Thank you! They were definitely a hit here. Your Blondies look delicious! Hope you are having a great week and thanks so much for sharing your awesome post with us at Full Plate Thursday! I was here the day you posted this on Instagram since I was drooling over this to much to focus on anything else. Can't believe I am just getting to commenting now, but I so have to make these! These look delicious! My middle son loves to bake and he adores both blondies and Oreos. He's going to love this. Pinned. They are easy enough for him to help make them too! Thank you! They went fast here too. I left a couple at home for the boys and my coworkers made quick work of the rest!